Registration is Now Open for the 2018 Florida Institute! http://fchonline.org/wp-content/uploads/2016/01/FCH-New-Logo-300x94.jpg 0 0 Robyn Andrews http://fchonline.org/wp-content/uploads/2016/01/FCH-New-Logo-300x94.jpg Robyn Andrews2018-03-01 07:00:482018-03-01 00:25:50Registration is Now Open for the 2018 Florida Institute! Dates Announced for the 2018 Florida Institute Conference! Registration will open in early March. Check back here for details. Hotel Room Reservations are now available! Click Here to make your hotel room reservation at the Renaissance at SeaWorld online! We have secured a special rate of $129 per night for the 2018 conference! Reserve your room online through the above link, or call the hotel on their group reservation line: 1-407-351-5555 or 1-800-266-9432, and mention the “Florida Institute on Homelessness and Supportive Housing” for the group rate of $129/night. This rate is available for 3 days prior and 3 days following the event dates of 10/31/18 – 11/2/18. http://fchonline.org/wp-content/uploads/2016/01/FCH-New-Logo-300x94.jpg 0 0 Robyn Andrews http://fchonline.org/wp-content/uploads/2016/01/FCH-New-Logo-300x94.jpg Robyn Andrews2018-01-24 21:27:002018-01-24 21:29:36Dates Announced for the 2018 Florida Institute Conference! Thank You to All Attendees and Sponsors of the 2017 Institute! The Florida Coalition for the Homeless, in partnership with the State Office on Homelessness, thanks our attendees and sponsors for their support of this year’s Institute. Workshop presentations that have been made available by our presenters can be downloaded HERE. The Institute took place on November 1-3, 2017 at the Renaissance Orlando at SeaWorld, Florida. This year’s theme, Breakthrough to Excellence: Building Bridges to the Future, was a tremendous success, with over 400 attendees from across the State. Our “State of the Nation” and “State of the State” Plenary sessions featured national and State partners, as well as Keynote Address; “Ending the Criminalization of Mental Illness“, featuring Judge Steven Leifman, Chair, Task Force on Substance Abuse and Mental Health Issues in the Court, Supreme Court of Florida. This year’s pre-conference day was comprised of a variety of half and full day intensive workshop sessions featuring the State Office on Homelessness, the Office on Substance Abuse and Mental Health, The Veteran’s Administration, the Florida Department of Education, and the Florida Housing Finance Corporation, as well as a full day SPDAT training with Orgcode’s Iain De Jong. The Coalition extends a special THANK YOU to all of our sponsors. Your support enabled this event to be successful and beneficial to all attendees! http://fchonline.org/wp-content/uploads/2016/01/FCH-New-Logo-300x94.jpg 0 0 Robyn Andrews http://fchonline.org/wp-content/uploads/2016/01/FCH-New-Logo-300x94.jpg Robyn Andrews2017-12-06 21:17:022018-07-18 15:12:05Thank You to All Attendees and Sponsors of the 2017 Institute! Please visit FloridaDisaster.org for information on receiving emergency assistance in your area. Our hearts are with everyone impacted by Hurricane Irma, particularly those without a home. Tremendous efforts were made throughout the State to ensure that everyone had safe shelter from the storm. 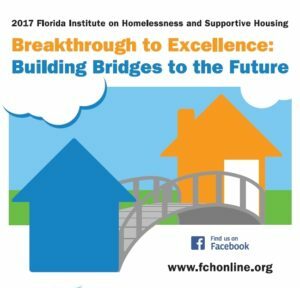 The Florida Coalition for the Homeless, in partnership with the State Office on Homelessness, invites you to attend sponsor, exhibit, or advertise at the 2017 Florida Institute on Homelessness & Supportive Housing. Click HERE to Register and for more Conference information! The Institute will be hosted on November 1-3, 2017 at the Renaissance Orlando at SeaWorld, Florida. Please join us to make this year’s theme, Breakthrough to Excellence: Building Bridges to the Future, become a reality. Join us for our “State of the Nation” and “State of the State” Plenary sessions featuring national and State partners, as well as Keynote Address; “Ending the Criminalization of Mental Illness“, featuring Judge Steven Leifman, Chair, Task Force on Substance Abuse and Mental Health Issues in the Court, Supreme Court of Florida. This year’s pre-conference day features a variety of half and full day intensive workshop sessions featuring the State Office on Homelessness, the Office on Substance Abuse and Mental Health, The Veteran’s Administration, the Florida Department of Education, and the Florida Housing Finance Corporation, as well as a full day SPDAT training featuring Orgcode’s Iain De Jong; all included in your registration! If you are interested in attending the full SPDAT training, please be sure to select it during your registration – spots are limited and will fill up quickly. Unfortunately, it has been brought to our attention that there are multiple companies contacting our past attendees, claiming to represent FCH and/or the FIHSH Conference (and/or leaving out important information so that it’s not clear that they do not represent us), offering “assistance” with exhibitor registration and hotel bookings. Some are coming from the number 888-511-7936 and saying they can help with the FIHSH conference you are planning to attend. Two such companies that are aggressively cold-calling and spamming companies whose names have appeared on our “attending company”, “speaker” and “exhibitor and sponsor” pages are Exhibitor Housing Management (EHM / ehmtravel.com) and Exhibition Housing (EHS / ehshousing.com). 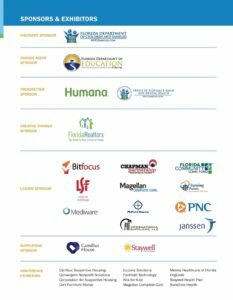 To be clear, these companies and others are NOT IN ANY WAY AFFILIATED WITH FCH or the Florida Institute on Homelessness and Supportive Housing and are not authorized to use our name or trademark in any solicitations. We are working through the proper channels to stop the deceptive practices of these companies and apologize for their annoying behavior. If you get a call from 888-511-7936 asking to speak to you about the FIHSH conference you are planning to attend, this is not from us, it is a scam. No one should contact you directly to book your hotel room or offer you a “special discounted conference rate” or “can save you $30.00 off your room rate”. If you receive one of these calls or emails, it is a scam. They are not affiliated with us. ignore this message. This company is not affiliated with us, and it is a scam. If you receive a phone call from someone wanting to speak to the “tradeshow coordinator or the person who is handling Florida Institute on Homelessness and Supportive Housing that your company is attending in November”, it is a scam and they are not affiliated with us. If someone emails you claiming to be from Florida Institute on Homelessness and Supportive Housing, or FCH, Exhibitor Department, and the email is not from an FCH or AK Consulting email address, do not share any information with them. The company is not affiliated with us, and it is a scam. We apologize to any attendees/exhibitors/sponsors who have received these scam calls or messages and assure you that we are not affiliated with these scammers.